200X Pressure Reducing Valve - Shanghai Taitong Valve Co., Ltd. The valve maintains a preset downstream pressure, regardless of upstream pressure or flow fluctuation. 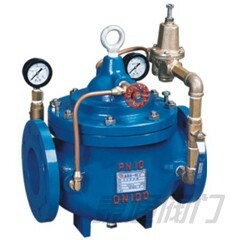 The main valve is controlled by a pilot valve, which makes the main valve modulating to maintain the downstream pressure.